Whether you’re escaping for a three-day weekend this Labor Day or planning on an extended summer getaway, see what our expert Stylists are packing for their summer destinations. Need some tips on how to save space in your suitcase? They’ve got those too! See what our Stylists are packing for their trips! Headed to a warm weather destination for a long weekend? “I always bring along breezy pieces to every sunny destination I head to,” says Stylist Anne R.
Swap your everyday basics for statement-making pieces—like off-the-shoulder dresses and embroidered totes. You’re on island time, so don’t be afraid to wear items you wouldn’t normally reach for on the mainland. Don’t forget to pack the perfect pair of shorts for your shape or those easy, walkable sandals in a neutral shade to go with every outfit. Stylist Tip: Pick versatile items that coordinate with your daily activities—then just add fun accessories to add a stylish touch. 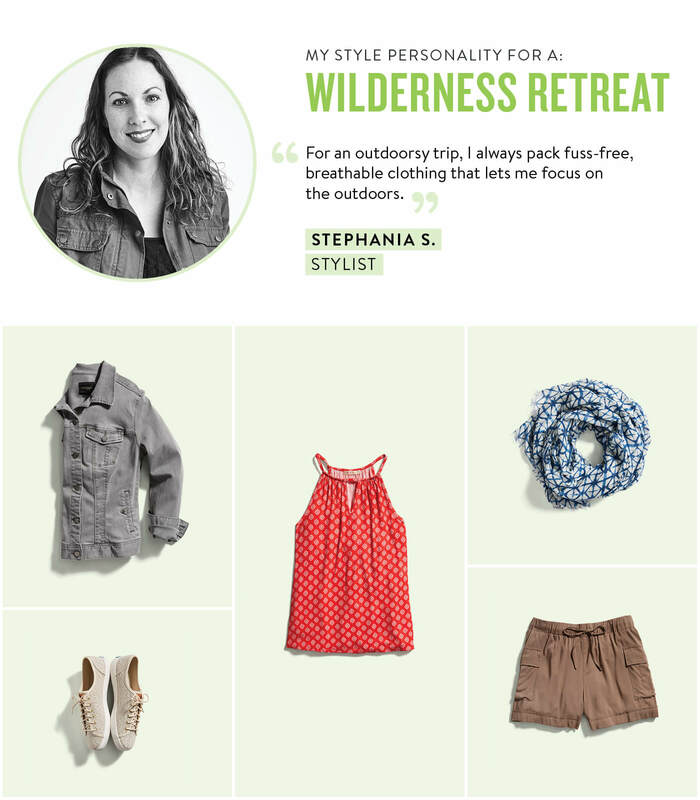 “For an outdoorsy trip, I always pack fuss-free, breathable clothing that lets me focus on the outdoors.”—Stylist Stephania S.
Make sure your favorite fabrics make it into your backpack—like linen shorts and cotton tanks—to keep you cool. Closed-toe shoes are a must, so bring a trusty pair of hiking boots but also canvas sneakers that you can easily throw in the wash when you’re home. 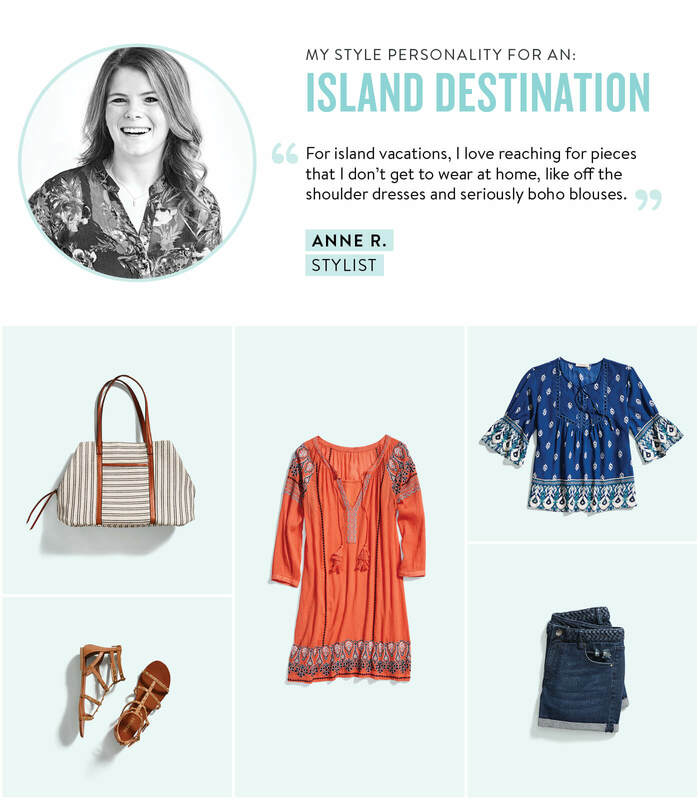 Stylist Tip: Build your vacation wardrobe around versatile basics that are easy to mix and match. For a summer escape to the concrete jungle (or even a small town! 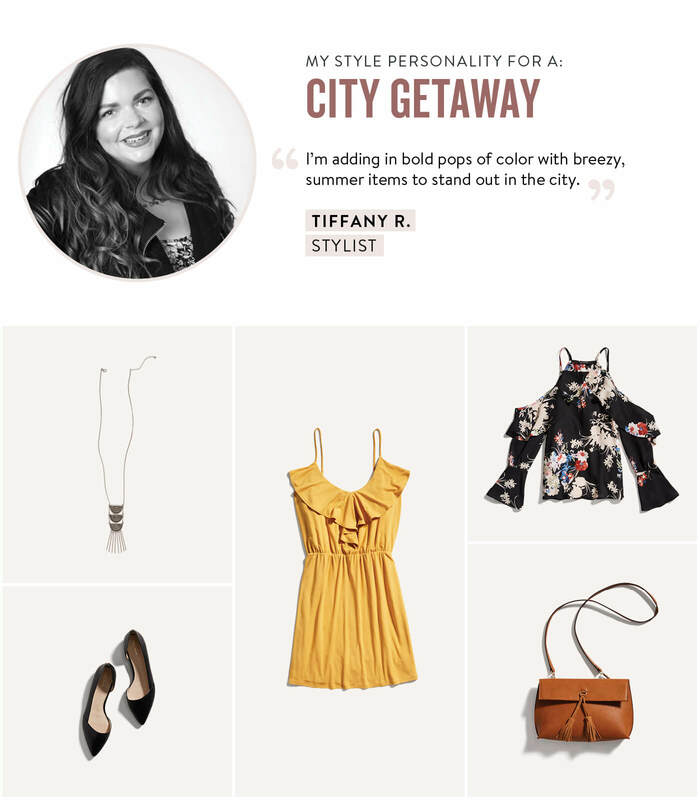 ), “It’s all about packing items that can take you from day to night,” says Stylist Tiffany R.
Packing for a city getaway? Bring on the vacation with on-trend items like bell sleeves and summer brights in lightweight fabrics like rayon and cotton. They’re not only breathable but totally easy to pack, too! And, be sure to bring a cross-body bag to store all your essentials while you’re out and about. Stylist Tip: To save space in my suitcase, I roll my clothes instead of folding them. Take a shirt, fold it in half lengthwise, then just roll! Ready to schedule a Fix for your summer vacation? Tell your Stylist where you’re headed in your profile!